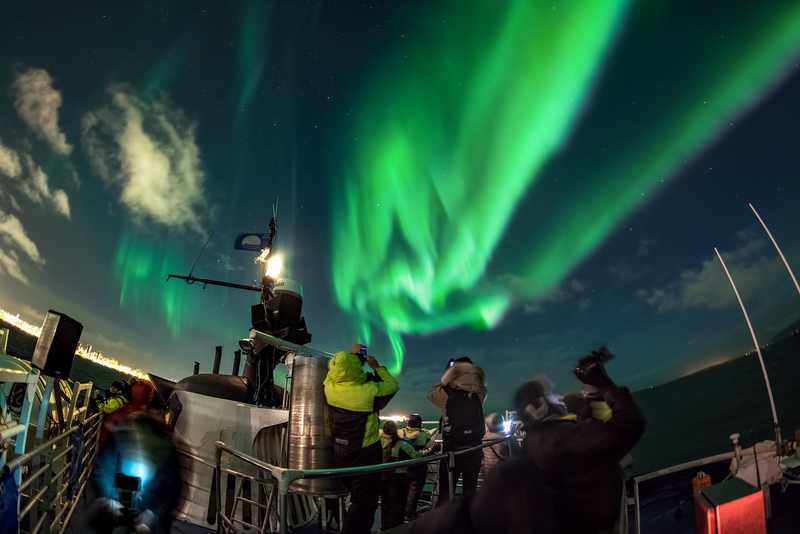 See the Northern Lights from the open waters of Faxaflói Bay, on this boat cruise that sets out from Reykjavík’s Old Harbour. 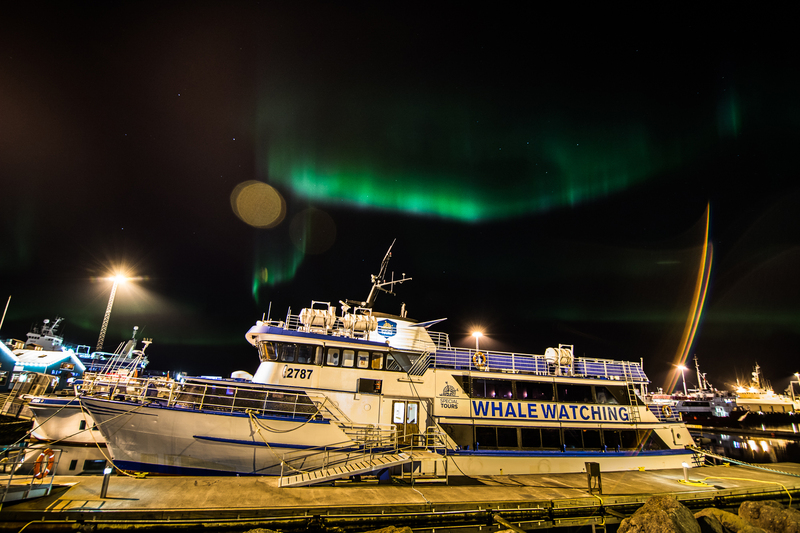 If you’re staying in the capital but wish to escape the city lights to bask in the glow of the Aurora Borealis, this is the excursion for you. Your adventure begins at the scenic Old Harbour by Reykjavík's city centre. The Harpa Concert Hall and Conference Centre lights up the area with an incredible glass panel display, as you board your boat and set sails for Faxaflói Bay. Prepare to see the Reykjavík shoreline in all its glory, until you escape the lights and are greeted by the darkness of winter. If the skies are clear, you will see the stars of the night sky shine brighter than before, with the only beacon of light being the luminous Imagine Peace Tower, where it rests in the island of Viðey. Then, prepare yourself for a stunning display of the Northern Lights, as they dance in an array of different colours, ranging from green and pink to purple and yellow. You will spend over an hour in the waters, but don’t worry about getting cold, since the boat boasts a cosy indoor cabin with a bar which you can retreat to at any time. Your expert local guides will share captivating stories and mythical folklore about the Northern Lights from different cultures around the world, as well as explaining the quintessential science behind this incredible natural phenomenon of the Arctic night sky. Now, the lights show up on their own accord and can never be unquestionably guaranteed, but by reading the cloud forecast and solar wind occurrences, the lights are often able to be calculated regarding their appearance. If, however, the Aurora doesn’t show on the night of your cruise, don’t worry, you will receive a free voucher to try again on any other night. 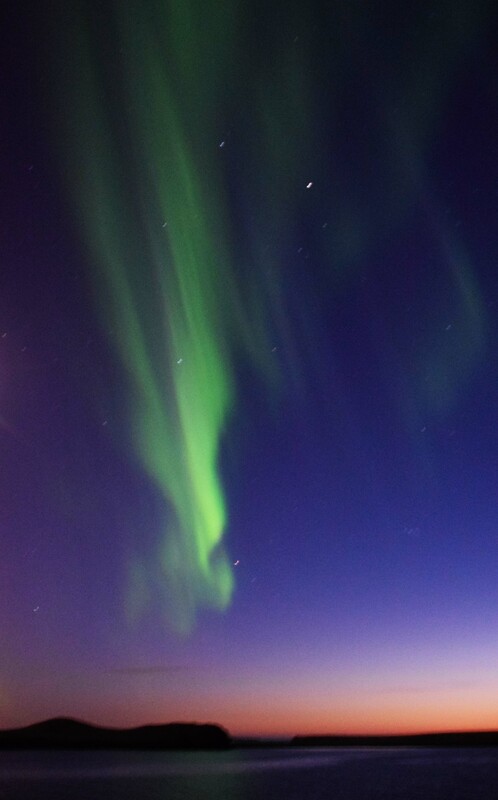 Make use of the darkness outside Reykjavík’s shores and book your Northern Lights cruise now. Check availability by choosing a date. Pickup time : 20:00, 21:00. Please note that these tours are subject to the correct weather conditions and sightings cannot be guaranteed. The right is reserved to cancel the tour due to unfavourable weather conditions if need be. 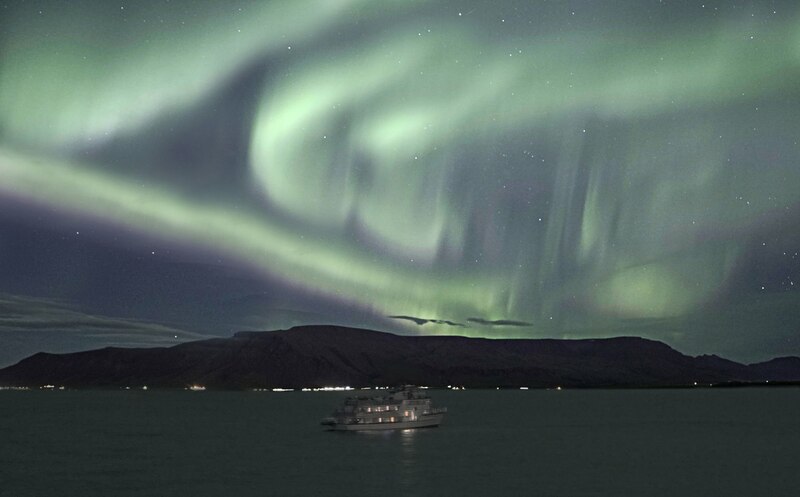 If you want to know the status of the Aurora forecast of the night of your cruise, contact the tour operator directly. The weather was a little bit cloudy but the guides were very patient and gave us every chance of seeing the lights. There was eventually a break in the cloud around midnight and we were treated to a 15/20 minute light show which was very lucky. 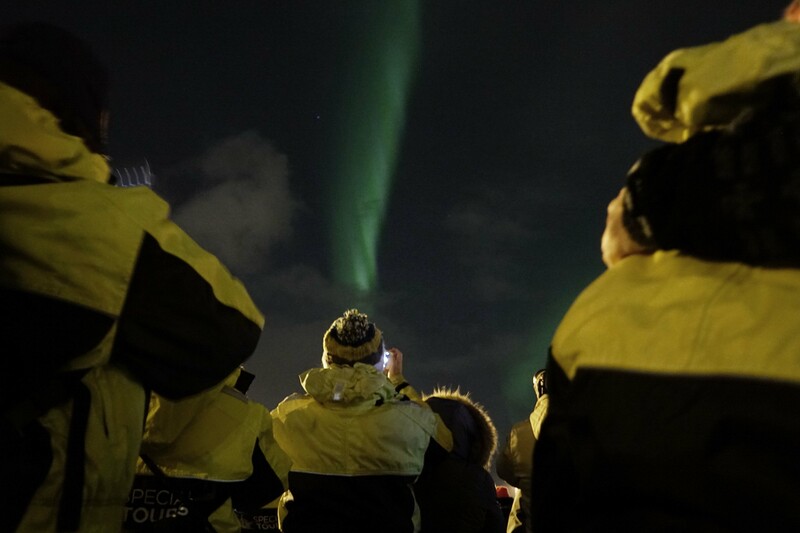 The guides were welcoming and knew their stuff and took photos of the northern lights which they then made available for us to download on their website. The boat was very comfortable and warm with good facilities and a great selection of food and drinks available. A friendly and helpful crew, would highly recommend. It was really great the tour! It was possible to see the northern lights, behind some clouds ... the guide was very nice and helpful! It worth the chilli cold weather ! Although we did not see much of the northern light, the tour did try and every is as described and expected. Windy, cold and lots of people so stand on deck the whole way. We went out on a night that was very cloudy so the odds of us seeing the lights were slim to begin with. Our tour guide was very hopeful and I enjoyed his enthusiasm after being awake for 30+ hours. At the end of the day we didn’t see the northern lights but had we seen them I think the boat cruise would have been a pretty cool place to witness them! The overall experience was extremely well done. When we missed our original scheduled tour, they were very understanding and allowed us to transfer to a different date. Pickup was prompt and smooth. The ship had ample coveralls available for additional warmth, which is highly recommended in January. The ship’s captain doubled as an entertaining and educational guide. Finally, we had an ideal night for viewing the lights and despite getting some decent shots with our equipment, we received some emailed pictures with excellent resolution from the tour. Overall excellent experience. I was psyched for this boat tour and happy that a minivan came for us but disappointed that there were about 200 people already on the boat ‘Andrea’ and in the stairwell, that I couldn’t get to the lounge/bar level for a hot drink, or squeeze my way to the top. However, I was happy that I was dressed warmly and standing in the right place for my camera to see the lights (it was a ‘3’ that night) and that’s all that counts. I’m grateful the boat spent extra time waiting for the lights. It sure is fresh Atlantic air!